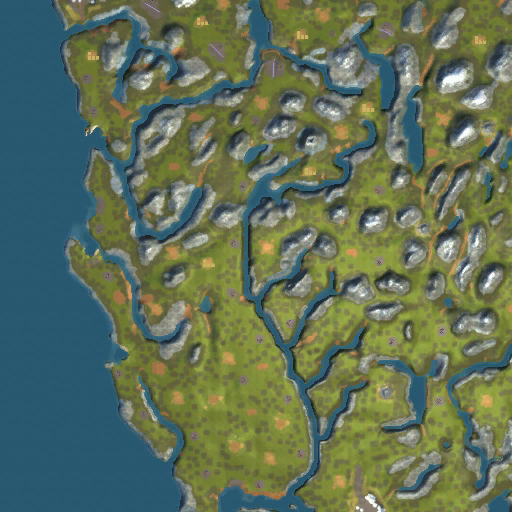 This map is a single player designed to run in 3 Eras from 1860 to 1950. All testing was done at the Mogul level. It took me several tries to get through it. Initially I could not get it to run on my Windows 10 desktop, so the testing was done on my old laptop running Windows 8. After completion I loaded it back onto my desktop and it ran fine. Now it did take a couple of attempts to get it to start. I keep getting C++ Runtime errors, but that seems to be par for the course with Windows 10 and my desktop. Hopefully, if you are running Windows 10 it will run fine for you. If you find you get some kind of an error, don’t give up. Sometimes it seems like it just takes a few tries to get it going, and then it will run OK.
On game play, there are a lot of options on where to run track. If you find you are stuck in Era 1, try another approach. It can be done. I did a little testing at the Robber Baron level just to make sure that you could get the map started. A few adjustments to the RRT_Difficulty.xml were made as a result. There are a number of locales that need to grow before goals can be met. Do not wait too long to get those growing. It should be noted that the game includes a good called Light. The lighthouses are setup as industries so that a game save and subsequent load will not make them disappear which would happen if they were set up as decorations. The good light has no value and should be ignored. I downsized the map quite a bit from what it initially looked like. It originally featured 3 sets of train cars and a number of additional engines. It was just too heavy. All version 3 material (train cars and diesels) have been removed. I think it runs well now and in a reasonable time frame. I hope you enjoy it and find it gives you a challenge. Nice runs well on windows 7..
Hello Slider38. I am enjoying Northern California. Thank you once again for your great maps! They are appreciated. Thanks for giving it a try. The nest map is underway. I’m trying to get this to run on my Mac. It stalls when loading; doesn’t crash, just stalls. Activity monitor shows CPU and disk activity, but it never finishes loading. Using a MacBook Pro, OS 10.14.2, 3.1 GHz Intel Core i7, 16 GB 2133 MHz LPDDR3, Radeon Pro 560 4096 MB Intel HD Graphics 630 1536 MB. Wish I could help. I’ve never owned a MAC. Perhaps someone in the Steam community would have an idea. Thanks for trying. Thanks for the reply! I may try running it in Windows on my Mac and see what happens. A new Slider map! I’m so excited! I’m currently playing through all your older ones again, can’t wait to try out this new one! Hello Emily. I hope you find it interesting and a bit of a challenge. At least, that was the goal. I’ve got a new one, St Louis Rails underway, but it will be a while before I get that out, but progress is being made. Take care. I am looking forward to enjoying St. Louis Rails. Your maps are always a fun challenge.